New Orleans in 1907. Martin Behrman was in the middle of his first term as Mayor. William Woodward founded the School of Architecture at Tulane University. Carrie Nation brought her famous hatchet to the Crescent City. Jazz pioneer Buddy Bolden was committed to a mental institution. The Dixie Brewing Company was established. And, of course, Carnival happened, culminating with Mardi Gras on February 12. 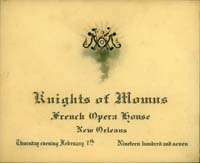 This month's Gallery recalls that Carnival season one-hundred years ago with examples from the Louisiana Division's collection of Carnival ephemera: krewe invitations, admit cards, and dance cards, along with float illustrations taken from the "Carnival Bulletins" of that era. 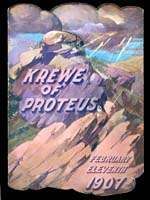 The brief elaborations on the various krewe themes are taken from Arthur Burton Lacour, New Orleans Masquerade: Chronicles of Carnival (New Orleans, 1952). We've also included some bits of personal information on the people who are represented by the images on display. HAPPY MARDI GRAS!